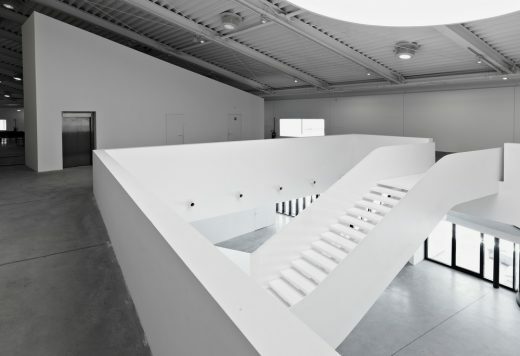 The first center for contemporary art in Italy was born in Prato in 1988. Conceived by entrepreneur Enrico Pecci and donated to the city in memory of his son Luigi, the Center was built with the support of several founding partners, including the Municipality of Prato, the local industrial association, Cassa di Risparmio di Prato, and a large group of private citizens: a rare Italian example of collaboration between public institutions and private patrons. Its mission was promoting a sensitivity towards emerging art —both national and international— by means of temporary exhibits, didactic activities, shows and multimedia events. 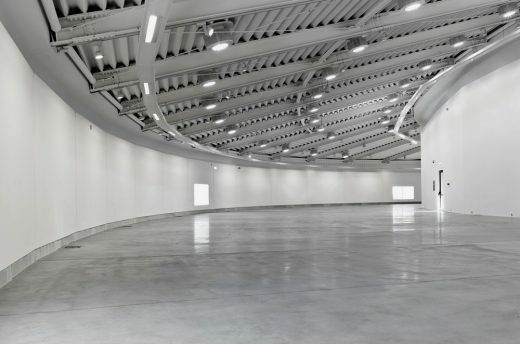 The Pecci Center boasts a unique collection in Italy with over 1.000 works by leading international artists: from Anish Kapoor to Jan Fabre, from Jannis Kounellis to Sol LeWitt, as well as the great Italians of the last century, such as Mario Merz or Michelangelo Pistoletto. A patrimony regrettably sacrificed in the storerooms for a long time due to a lack of exhibition space. 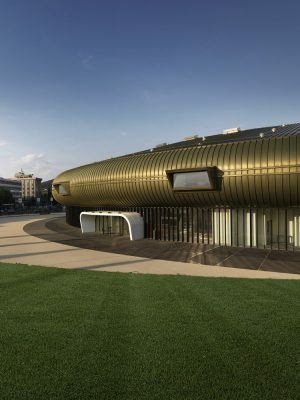 To ensure that these assets be given due recognition, in the early 2000s the Pecci Center decided to double its exhibition space and, at the same time, renovate the original building by Gamberini, some aspects of which had become critical and obsolete. The enlargement works, funded by the Municipality of Prato and the Region of Tuscany (through European Funds), started in 2006 and focused on the construction of a new wing with strong architectural impact, connected to the original building, whose functions and services were redeveloped and upgraded in the meantime. The Embassy of the Kingdom of the Netherlands in Rome supported the birth of the new building. Once the works are complete the complex will cover a surface area of almost 10,000 square meters, and in addition to the exhibition spaces there will be an archive and a specialist library with a holding of over 50,000 volumes, an open-air theater with 1,000 seats, a cinema/ auditorium with 140 seats, a performance space with 400, a bookshop, a pub/bistro and a restaurant, in addition to workshops and various meeting rooms. And so today, after almost thirty years of activity, the Pecci Center doubles. In two ways: it extends its building and expands its cultural program. 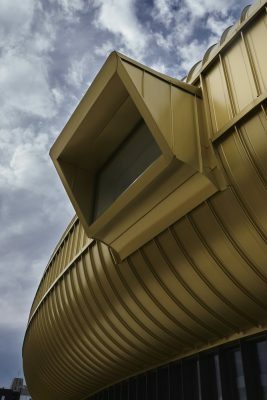 These two initiatives are deeply related as they result from the same objective: endowing the Center for contemporary art Luigi Pecci in Prato of a new cultural energy, capable of expressing itself both through the contents of the exhibits and through its built spaces. This energy will engage the territory thanks to a new architecture, which was conceived so as to provide the pre-existing structure with new functions, to double its surface area, to establish new relationships between the museum and the city, between art and the regional territory. The project for the extension is signed by Maurice Nio —the Dutch architect, founder of Rotterdam-based studio NIO architecten www.nio.nl— one of the most original interpreters of contemporary architectural culture. The project, commissioned by the Pecci family, is stimulated by the will of taking full possession of the new cultural program of the museum. The collection of art works —which is constantly growing and is oriented, in the last years, to focus on the Italian and regional artistic production— has urged the need for new spaces that could permanently host the rich artistic patrimony. 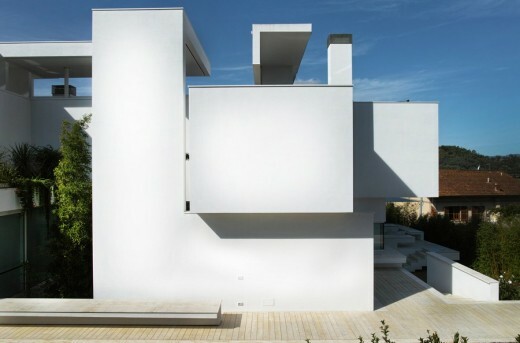 Nio’s project intends to favor the permeability between the center and its territory. The existing building is entirely maintained and left completely intact. A new volume in the shape of a ring, that traces over the contours of the original surrounding garden, is oriented towards the public dimension. Thanks to the new entry, the bookshop, and the restaurant, all located in the transparent ground floor, the Center turns to the outside, stimulates curiosity, invites interaction, opens itself to the city, with an experimental garden and a large piazza as a buffer. 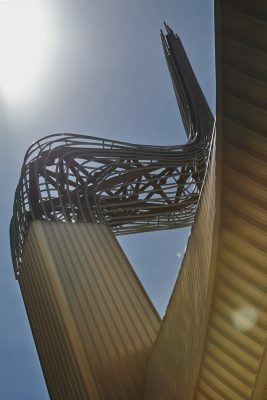 The highest point of the whole complex is reached by a sort of antenna which is capable, on one side, of representing the will to sense the new forms of creativity which are pulsing in the territory, on the other side it reveals the important presence of a venue that will promote them. Ever since the early design phases, Maurice Nio chose a highly evocative title for the new building: Sensing the Waves, suggesting its function as a receptor (and perhaps even transmitter) capable of capturing and disseminating the vibrations of the present time. Underneath the antenna, a new map of functions and routes links the original building by Italo Gamberini to the one designed by Maurice Nio. The project is based upon a deliberate modification of the exhibition functions which are now revealed to the outside by means of the realization of an ambiguous, unexpected, unusual object that can be interpreted in many different ways. The subtle and reasoned language seems to go beyond the current international trend of realizing art centers as big urban icons. By confirming its attention towards the international scene and by strengthening its link to the territory, the Centro Pecci is today undertaking a new important objective to be carried on for the next decades. At the time the new Centro Pecci inaugurates, the city of Prato itself is displaying great exuberance and vitality. On October 1 the international jury for the Parco Centrale di Prato competition (www.ilparcocentralediprato.it), presided by Bernard Tschumi, will select the winner among the 10 finalists. The task of defining a new urban park is especially challenging and raised a lot of interest in architects from all over the world. The competition brief calls for the design of a 3-hectare park on the area of the former municipal hospital which, once demolished, will return to the city a vast public space inside the perimeter of the city walls. The finalists, selected among 230 candidates from all over the world, have to search for new relations between urban space and natural landscape. The exhibition presenting the design proposals by the 10 finalists and a round-table discussion on the results of the competition will take place at the Teatro Fabbricone in Prato (7 – 23 October 2016). The exhibition will open on Friday October 7 at 5 pm. The Parco Centrale di Prato competition is also the pretext for a series of other events that reflect upon the condition of the contemporary city, such us the workshop led by the Belgian team of architects and designers Rotor Deconstruction (www.rotordeconstruction.be), facilitators in the business of salvaged building components and in the reuse of construction materials. Rotor Deconstruction’s workshop, which is scheduled to occur between October and November 2016, will lead to the design and construction of a “memory pavilion” of the former municipal hospital. Such pavilion will be assembled using building components salvaged from the demolition of that building and will be placed inside the future park. The city of Prato is facing another urban and social challenge in an area of the city that was named “Macrolotto 0” by Bernardo Secchi, renowned Italian urban planner who in 1993 started conceiving the plan for the city. This neighborhood, in the heart of the industrial district of Prato and characterized by high urban density and the close coexistence of several ethnic groups, is the object of a Piano di Innovazione Urbana (Urban Innovation Plan) co-financed by the Municipality of Prato and the Region of Tuscany. Ranking first in the regional selection and awarded a funding of 6.000.000 Eur, the PIU aims at reviving the neighborhood by endowing it with a series of public facilities which, by promoting social cohesion, will trigger the birth of a creative district. The project for the extension of the Centro per l’Arte Contemporanea Luigi Pecci, signed by architect Maurice Nio, is part of a predominantly industrial area, economically vibrant but still devoid of any prominent architectural feature. 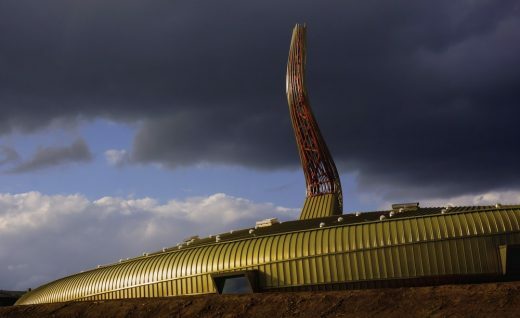 It is conceived as an extension and connection for the original building, designed by Italo Gamberini with a profile that was strongly influenced by the surrounding industrial landscape and completed in 1988. The complex is located near the East exit of the A11 autostrada, along the highway that connects Florence with Pistoia. A place of transition and transit, where the existing building stands “like the imperial palace in Tokyo, visible to everyone but very inaccessible”, notices Maurice Nio who, with this observation, pinpoints the primary aim he gave himself when designing the extension: to declare the presence of the Center, to highlight its access points —rather hidden until today—, to invite the public to explore its spaces, its collections, its exhibitions. Also, the project is meant to complete and reorganize the circulation within the art center, refining its exhibition possibilities and enhancing its use. “Sensing the Waves” is the name Nio himself gave to his project. A declaration of intent and a program. The antenna is a sensor, a system capable of intercepting (and transmitting) forms of creativity and artistic productions in the region. Its form can be strategically interpreted in many ways, according to the viewer’s imagination and fantasy: a disc, a ring, a long wave, a horseshoe, a spaceship, a sliver of the moon, a piercing as someone already described it. A scenic presence, an urban signal, an attention-grabbing element. An object that senses, stimulates reactions, elicits visions. “As opposed to the rather rigid, mechanical character of the existing museum building ―partly inspired by the industrial architecture in Prato―, the new project”, recounts Nio, “looks fluid and ecstatic. 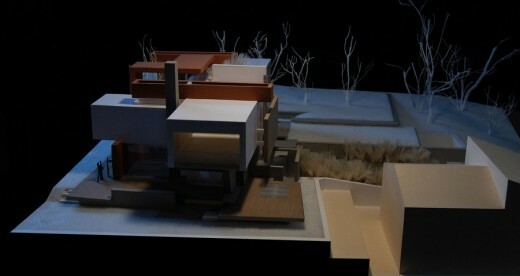 It embraces the existing building and touches it only there for where needed for the circular plan”. In addition, Nio’s project aims at establishing an interaction with the city around: the green area around the Pecci Center —formerly the site for an open-air art collection— was reorganized and made more practical and more visible both from the boulevards around the museum and from the eyes, sort of large portholes, of Nio’s ring-like extension. Contemporary art now escapes the envelope of the museum space and discloses itself to the city. The new spaces of the Pecci Center are arranged along the circular extension embracing the existing structure. Nio’s extension joins the two ends of the original building. 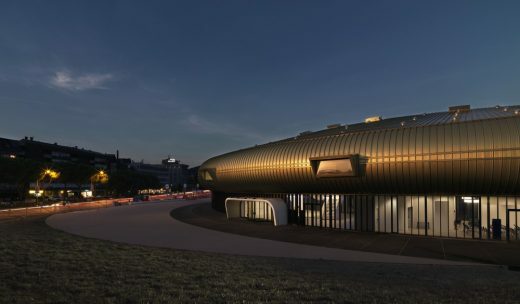 It encompasses two levels: the ground floor hosts all facilities aimed at visitors and opens itself toward the city by means of a glazed facade; the upper floor is devoted to the exhibitions, its outer envelope a warm, bronze-colored metal skin. Besides hosting new functions, the ring allows the preexisting building to double its surface area and to diversify its flows and trajectories. The SupraSensitivity in Architecture exhibition, that opens at the Centro Pecci on the occasion of its inauguration of October 16, features 120 art works made by different architects invited by Maurice Nio to contribute to the SupraSensitivity in Architecture book soon to be released by Dutch publisher UITGEVERIJ 1001. Si tratta di un nuovo tassello del percorso editoriale che Maurice Nio ha avviato nel 1998 con il volume You Have The Right to Remain Silent e continuato nel 2004 con Unseen I Slipped Away attraverso il quale l’architetto olandese ha intrattenuto un costante confronto con altri artisti e architetti. Ognuno dei tre volumi affronta un tema specifico, toccando l’essenza profonda dell’architettura e le dimensioni nascoste del processo progettuale in maniera inconsueta. Each of the three volumes treats a particular theme which, in turn, deals with the essence of architecture and the hidden dimensions of the design process in an unexpected way. Among the invited architects: Giacomo Garziano, Martin Vybíral, Radek Brunecky, Nailia Aizatullova and Si [Muse] Miao & Tatiana Plakhova. The 120 artist-works give us insight in what we can see with our mind’s eye, the eye that feels and develops awareness.